4 teams are left in the EU LCS Summer Playoffs, as we are heading towards the semifinals of the tournament! While H2K and the Unicorns of Love have already made an appearance on the playoff stage Fnatic and Origen had 3 weeks break from competitive League of Legends which gave them a lot of time to train and work on new strategies – not that Fnatic really needed to step up their game after their perfect regular summer split. The Unicorns are facing a though challenge. Like all other rounds of the Playoffs, the semifinals will be played in a best of 5 series. The second last round, like all rounds of the Playoffs will be played on patch 5.14. More information about the 2 matches will be added when the previous round has been played. The second last round of the EU Summer Playoffs, the semi-finals of are running from Saturday, August 15th to Sunday, August 16th. Both matches will be a best of 5 series which might take a couple of hours. The broadcast of the live stream is scheduled for 08:00 AM PDT | 17:00 CEST on both match days. The broadcast of the EU matches is followed by the NA semifinal matches. Please note that the starting times of the matches may vary from the schedule. The betting odds overview will be added when the betting sites have the markets online. 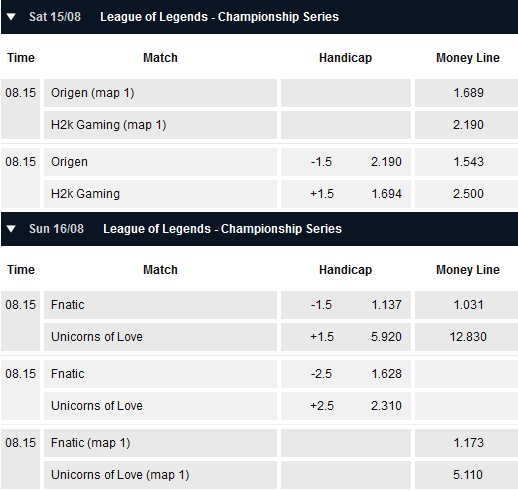 You can find out more about the different LoL betting sites in our esports betting sites overview.